Road trips are an exciting way to explore new places and destinations. When you travel by car, your whole route becomes part of the experience. 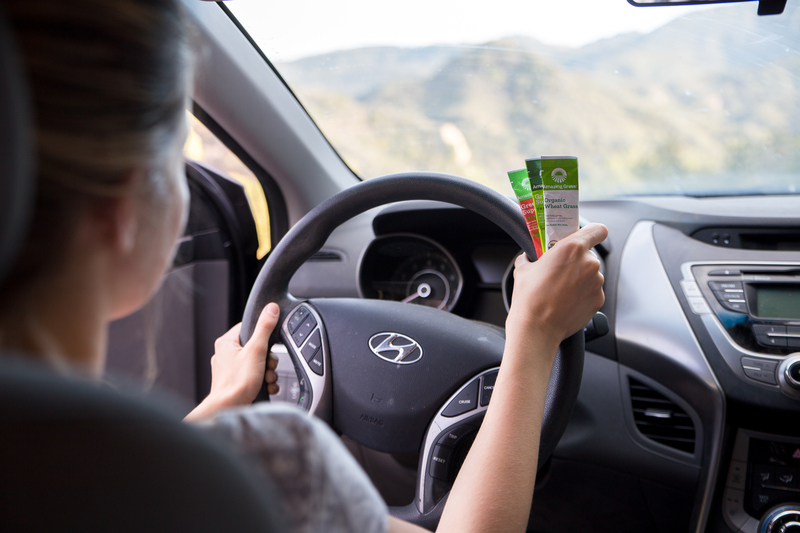 Though road trips can be a fun way to travel, it can often be difficult to find healthy options and eat well en route. Here are some of our tips for staying healthy on a road trip! 1. Plan your non-perishables ahead of time. So long as you have room in the car, stock up on your non-refrigerated items before your trip. We like raw nuts, dehydrated veggie chips, and rice crackers. 2. Pack a cooler. If you have a reliable way to keep things cold, you can pack fresh fruits and veggies and organic dairy like yogurt or string cheese. If you plan on staying in hotels, you can check that they have a mini-fridge to re-freeze your ice packs each day. 3. Stay hydrated. Being in a car for long hours can be dehydrating, so pack a case of water so you never have to stop when you need a drink. Even better, consider buying larger jugs of water and filling reusable bottles! 4. Add greens. It can be hard to pack a lot of nutrition in a small package, but our Green Superfood packets and Wheat Grass packets make it easy. Add a packet to organic juice for a powerful blend of nutritious greens, phytonutrient-packed fruits, veggies and cereal grasses, digestive enzymes, and probiotics. 5. Stop at grocery stores. Don’t forget that your only option isn’t fast food or convenience stores. Make a point to stop at grocery stores along the way to load up on healthy snacks when you run out. Many grocery stores often have affordable salad bars and other healthy options.